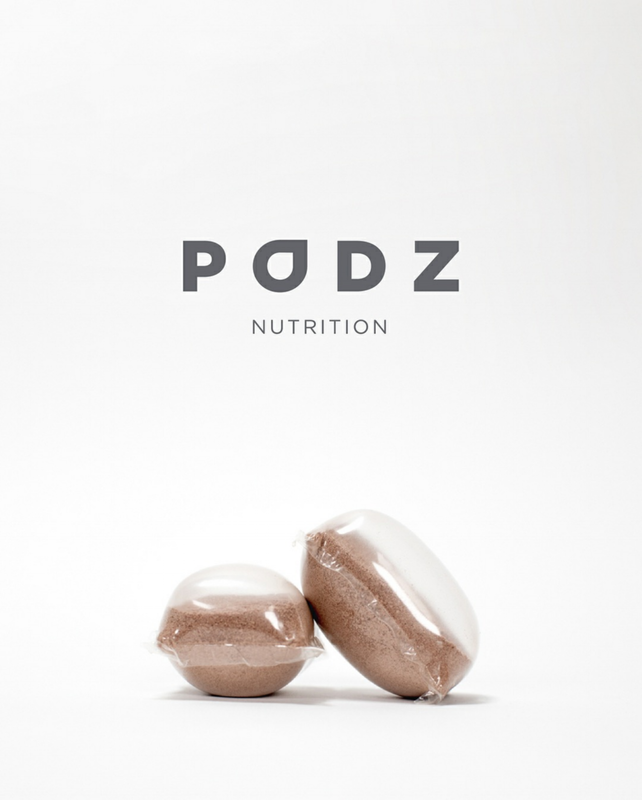 PODZ Nutrition released their first protein product in April 2018 called PODZ. I’ve been taking protein supplements since around age 16 so nothing in this market is ever really new to me. PODZ is the exception. PODZ are water-soluble pods packaged in film made from 100% food grade ingredients, providing a grab and go solution that is completely waste-free. I typically love to elaborate on the X’s on O’s on how to use supplements but this is incredibly easy. Step 1: Drop 2 pods into 8-12 ounces of water or milk. Step 2: Shake or stir container. That’s really all you have to do. You’ll never even touch any powder. Based in Orange County, CA, PODZ Nutrition is a company whose main goals are to provide convenience and portability to how people interact with sports nutrition products. Read to find out more about the unqiue PODZ. The serving size is two protein pods, equaling a total of 45 grams of powder. Here are the supplement facts per serving. The ingredients listed are protein blend (whey protein isolate, whey protein concentrate, micellar casein, egg protein), cocoa powder, MCT Oil Powder, Natural and Artificial Flavors, Soy Lecithin, Vanilla Cream, Xanthan Gum, Salt, Sucralose, Polyvinyl Alcohol, Propylene Glycol, Cellulose Gum, Glycerin, Water, Xylitol, Sorbitol, and Polysorbate 80. Of these ingredients, the most noteworthy of course is the protein blend. There are four different different types of protein in PODZ, two of which are forms of whey protein. According to a 2010 Nutrition & Metabolism review, “Most, but not all studies have shown that supplementation of whey alone or with carbohydrates immediately after and possibly before and during resistance exercise can enhance the muscle hypertrophy response to resistance training in healthy adults. Some studies also suggest that whey may enhance recovery from heavy exercise and possibly decrease muscle damage and soreness. So what’s whey protein? Cow’s milk is made of about 80% casein and 20% whey. There are different types of processing methods to get these types of proteins into powder. In general, milk typically gets span so the fat is on the top and everything else is on the bottom. Most of the fat is removed at this stage. Then, acid is added to the fraction that’s left over to separate the whey and casein. Casein can’t be dissolved in acid so it sinks to the bottom. The whey concentrate is soluble in acid and will be the clear liquid on top. If you evaporate the liquid and powderize it, you’re left with whey protein concentrate powder. Whey Protein Isolate is made when you take whey concentrate through some type of filtration process which is usually very low in fat, lactose and carbohydrates. This type of protein may be better for people with lactose intolerances. It’s also more macro-friendly for people really watching their carbs, fats and total calories. And whey isolate is absorbed very quickly by the body in comparison to casein. Micellar Casein is water insoluble and coagulates, or clumps together, resulting in a slow-release mechanism of amino acids that is sustained at increased levels in the body for a longer period of time. This type of protein is popular to take at night, especially by fitness enthusiasts looking to keep amino acids flowing during their sleep. Eggs are one of the most protein-dense foods out there. One large cooked scrambled eggs packs about six grams of protein and three tablespoons of liquid egg whites pack five grams of protein. Eggs, like casein, digest slowly. There are companies that have tried to make protein consumption more efficient. With GudPod, you buy pre-filled protein pods and the GudPod machine which looks like a Keurig. Slide the GudPod pods into the machine, press a button and the powder drops into the cup and blends the powder into the liquid. The benefit for the average consumer appear to be the fact that you don't have to manually shake or blend anything: just press start and the pod releases into the cup underneath, mixing it on its own. What makes PODZ different is that GudPod isn’t portable whereas PODZ can be brought anywhere. GudPod is a stationary countertop device that is also mess-free but creates the protein for you into a glass. With PODZ, you choose the container–it doesn’t have to fit under a machine. Another similar product to PODZ is Vade Nutrition which actually also sells dissolvable protein pods. The nutrition difference between the two is that Vade uses only whey protein isolate whereas PODZ uses the four different types of protein. If bringing PODZ in my gym bag, school backpack, or laptop case, I would either A) Put them in their own ziplock just in case they get wet IN MY OWN BAG somehow or B) Put them in their own shaker, waiting for me to add water. Sometimes I wonder if it’s healthy to keep loose protein powder in a shaker cup with the metal ball inside. I’m not sure if the metal ball should be all up in powder for days before I even drink it. With PODZ, the powder never touches the shaker and the film dissolves anyway. Overall, PODZ makes it easier for fitness enthusiasts to pack light, avoid a mess and make room for other supplements in their travel bags. And, the chocolate flavor tastes smooth and clean. It definitely won’t get too thick or separate like a mass gainer would. Taking in all four types of anabolic protein may even make you feel more full throughout the day. 1. How did you get the idea to create PODZ? What problem were you looking to solve? My passion for fitness started as mandatory weight training for baseball in high school and transitioned into a way to relieve stress and stay in shape when I started studying mechanical engineering at UCLA. After I graduated in 2014, I immediately started working an 8 to 5 job, and I've always tried to find an hour in the middle of the day, during my lunch breaks, to hit the gym. That means taking the workout essentials with me to the office every morning, including my protein for post-workout. I had enough of scooping my protein into ziplock baggies. They end up littering my gym bag and find their way to a landfill. And listening to my entire protein tub roll around in the back of my car wasn't a great solution either. So the question I was answering with PODZ was this: how do I provide portability to individual servings of protein powder without the waste of single-use plastics? 2. What other PODZ Nutrition products or flavors are in the works? The plan is expand our offering into an entire line of sports nutrition products: Pre-Workout, BCAAs, Glutamine, etc. You name it, we'll give it to you in the convenience and portability of a pod. We'll start with rolling out additional flavors of our Extended Release Protein, and we're currently doing the initial R/D for pre-workout. 3. Which ingredients make up the edible pod? Everything after (and including) the Polyvinyl alcohol on the ingredient label is strictly pod material. Ingredient statements are listed from highest to lowest in terms of gram weight. Because there's only ~0.6g of film per pod, it's an extremely small amount of each ingredient. 4. How much of each type protein is in each serving? The protein breakdown is as follows: 12g of whey protein isolate, 11g of whey protein concentrate, three grams of micellar casein and two grams of egg protein. They key here was dosing the micellar casein and egg so that it's not heavy, because too much of those protein sources can cause bloating and fullness. We formulate everything ourselves and then have a manufacturer do the volume production.